Easy-to-use, no-rinse foam Ready-to-use, no-rinse foam stays in place to prevent product spills, waste and patient discomfort. One bottle contains more than 340 pumps of foam. Ideal for bedside care or even shower and bathtub use. Contains phospholipids to gently clean and condition Harsh soaps and surfactants strip skin of moisture and contribute to e-TEWL. Remedy cleansers are designed to be biomemetic, a term meaning to imitate nature. Rather than use detergents found in ordinary cleansers, Remedy products use phospholipids that can gently cleanse and condition the skin without stripping it of its natural oils. Tested to be tear-free While all Remedy cleansers are tested to be non-irritating, non-sensitizing, non-allergenic, and non-cytotoxic, the Foaming Body Cleanser has the unique claim of being tear-free as well. Ready-to-use, no-rinse foam stays in place to prevent product spills, waste and patient discomfort. One bottle contains more than 340 pumps of foam. Ideal for bedside care or even shower and bathtub use. Contains phospholipids to gently clean and condition Harsh soaps and surfactants strip skin of moisture and contribute to e-TEWL. 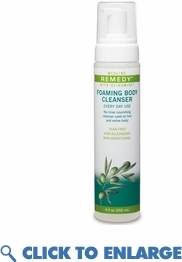 Remedy cleansers are designed to be biomemetic, a term meaning to imitate nature. Rather than use detergents found in ordinary cleansers, Remedy products use phospholipids that can gently cleanse and condition the skin without stripping it of its natural oils. Tested to be tear-free While all Remedy cleansers are tested to be non-irritating, non-sensitizing, non-allergenic, and non-cytotoxic, the Foaming Body Cleanser has the unique claim of being tear-free as well. Ingredients Water, Cocamidopropyl PG-Dimonium Chloride Phosphate, Aloe Barbadensis Leaf Juice, Disodium Cocoyl Glutamate, Polysorbate 20, Pyridoxine HCl, Niacinamide, Glycine, L-taurine, N-acetyl-L- cysteine, Methylsulfonylmethane, L-proline, Hydroxytyrosol, Allantoin, Linoleamidopropyl PG-Dimonium Chloride Phosphate Dimethicone, Disodium Lauroamphodiacetate, Propylene Glycol, Disodium EDTA, Diazolidinyl Urea, Methylparaben, Propylparaben, Vanillin, Citrus Aurantium Dulcis Peel Oil, Citrus Tangerina Peel Oil, Citrus Grandis Peel Oil.